Me with Little Baby...my studio companion and quality control inspector. I am a self-taught artist and come from a family of artists and musicians, and art has always been a part of my life. I have 3 brothers and 2 sisters whom are also very talented and creative. My early years were spent on a farm in Kansas, then we moved to Iowa where my parents still farm today. I am a farm girl and always will be. My mother taught me how to play the piano and my father started teaching me to draw when I was around 3-4 years old. He was all about detail, and I learned a great deal from him growing up. I remember as a child spending countless hours in my room sketching all kinds of animals. When the National Geographic would come every month I would get so excited to see the exotic animals and try to draw them all. I don't remember a time when I wasn't drawing or painting something. Back then we were taught to use our imaginations...we didn't have computers and video games like today so we had to come up with our own ways of having fun that didn't cost a lot of money. With 6 kids it wasn't easy for my mom and dad, but we always came up with things to do and I am so thankful for how we were raised. I live in Arizona, just outside of Phoenix with my wonderful husband, 4 cats, and 2 dogs. The deserts are beautiful and 9 months out of the year we enjoy mild temps but suffer through the scorching summers. I wouldn't want to live anywhere else though. There is so much to see and do in our beautiful state. For several years I was a graphic artist for a magazine in Scottsdale, AZ, but my heart has brought me back to painting once again. After over 40 years of trial and error, painting in different mediums, I feel I have finally hit my stride in my art career. I paint animals with great care paying special attention to the detail of the eyes and fur. I specialize in pet portraits and memorials. 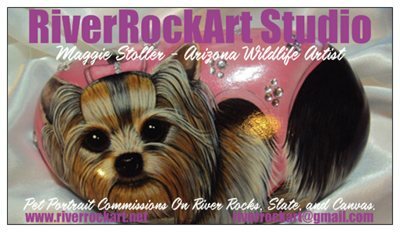 I take commissions all year and you can contact me at riverrockart@gmail.com to get on my calendar. I have so many ideas (a 4-inch binder of sketches and ideas) that I can't wait to do. I have just scratched the surface of all the possibilities that can be done on Arizona river rocks, slate, and canvas panels. I continue to hone my skills as an artist and learn something new each and every day. You will also see hand painted clam shells in the Store Gallery. I found these clam shells in Mexico years ago and have finally put them to use. They will be a limited edition to my artwork. When I run out, that will be it. So, follow me on my journey for my third year online. In the past I have done many juried art and craft shows. I did pretty well in those arenas, but I need a wider audience and exposure. This is new territory for me using the internet to get the word out and it's time for me to show the world what I love to do! he has found his true vocation.